To communicate the Night Tours offering, Joburg Zoo and Y&R South Africa set out to explore a highly impactful and interactive way to maximise awareness and to encourage visitors to book a night tour. 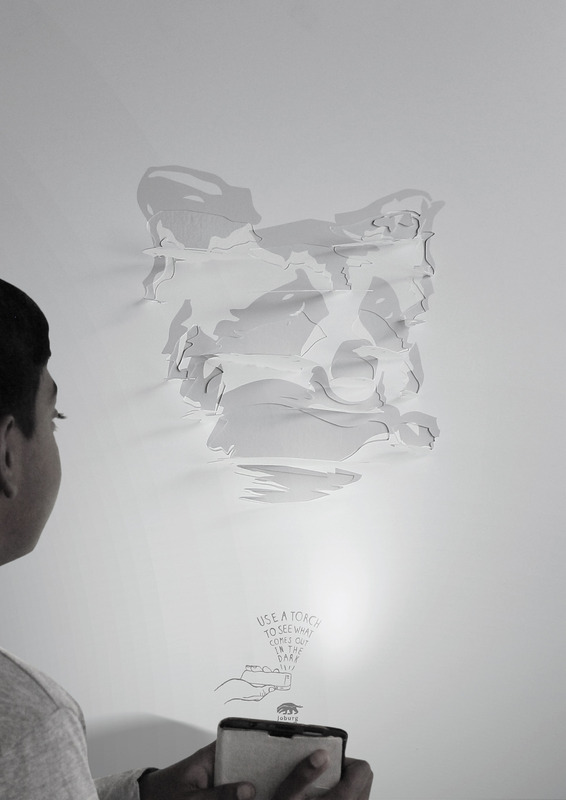 The resulting campaign, titled ‘Night Tour Shadows’, made use of bespoke foldable designs cut into posters with a call to action to shine a smartphone torch from below the folds. 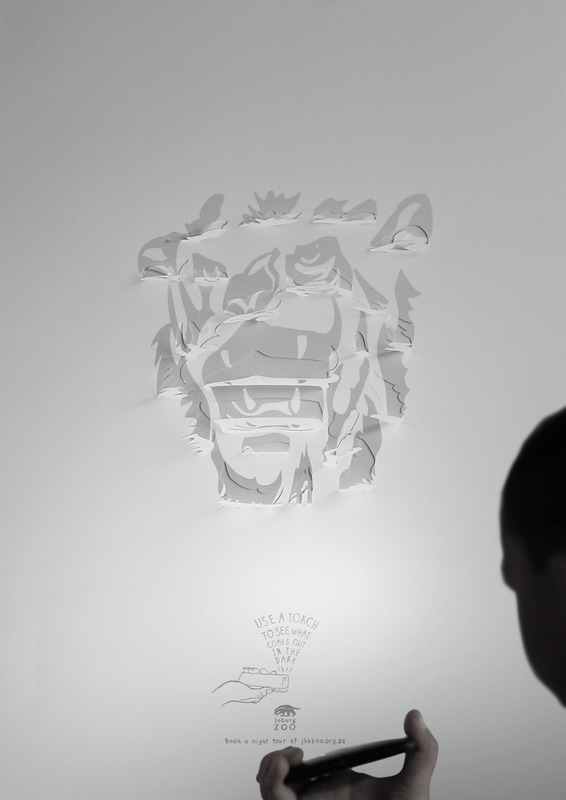 An installation was created at the Joburg Zoo, and schools, community centres and influencers were also targeted to interact with the posters. Watch the magic unfold here. Edcon recently announced the appointment of the Y&R Network as new agency for their Edgars Division. Y&R South Africa’s Cape Town office and partners recently celebrated the release of the final instalment of a three-part documentary series on #Operation45, a project that followed the progress of two small boys who received life-changing surgeries to correct their cleft lips. Commercials for two of Y&R South Africa’s clients, Sunfoil and Danone, cracked the Top 10 listing of the recently announced Millward Brown Q3 and Q4 2015 Best Liked Ads list. The 2015/2016 Sunfoil English Test Cricket Series, which comprised four Five-Day Test Series matches, concluded at SuperSport Park in Pretoria earlier this year. For the team from Y&R SA’s Durban office, who executed the stadium activations on behalf of their client, Sunfoil cooking oil, it was a project that highlighted the unique nature of Activation as a marketing discipline within the sport and cricketing space. On World Water Day on Tuesday, 22 March 2016, Western Cape Government (WCG) joined forces with the quirky Suzelle DIY and Western Cape Premier Helen Zille, in an attempt to illustrate practical ways to save water in the drought-ridden district. Y&R South Africa’s Cape Town office and partners launched the #Operation45 campaign during the Soweto Derby over the weekend, during which two boys received life-changing surgeries to correct their cleft lips. It was recently announced that Nkanyezi Masango, Creative Director at Y&R SA’s Cape Town office, has been selected as the only South African judge on the Advertising jury at the Art Director’s Club (ADC) 95th Annual Awards. “This is a win for all of us as a collective, and a culmination of our creative and business efforts over the last years, plus a focused development of a great environment to work in,” commented Graham Lang, chief creative officer of Y&R South Africa and Africa, following last week’s The Annual AdFocus Awards ceremony. As 2015 draws to a close, the industry is cataloguing the state of its business affairs in terms of new business acquisitions, sales, staff turnover, revenues, BEE ratings and creative rankings. Art director, Rowan Foxcroft, and copywriter, Graham Krige, from Y&R South Africa’s Cape Town office, recently represented Y&R South Africa at the fourth annual LIA (formerly known as the London International Awards) Creative LIAisons, in Las Vegas. Following this year’s Loerie Awards, Y&R South Africa has achieved its best ever ranking in the Creative Circle Ranking for Group Agencies and the Loeries Official Rankings, cementing a position in the top 3 respectively. The last time an advertising agency was approached to address the anti-immigration crisis, DC-based Elevación delivered thought-provoking, intelligent and inspiring work. That was in 2004. Creative director at Y&R South Africa’s Cape Town office, Nkanyezi Masango, recently represented the agency on the film jury at a prestigious international award festival in South Korea. A striking series of ads for the non-profit organisation, Surfshack Surf Outreach, offers an arresting look into the stories of vulnerable children in the Cape Flats – and how surfing gave them hope. Y&R South Africa recently promoted Mthuli Bam, a veteran senior TV producer who has been with the agency for more than half a decade, to Head Of Electronic Production. In an agency where insight, idea and impact is core to its culture and creative product, Y&R South Africa is thrilled to have renowned ad-man, Alistair Duff, join the team as head of strategy, responsible for agency clients nationally. Labstore South Africa, the shopper-marketing business unit of Y&R South Africa, recently won a highly coveted trio of brands in the General Mills stable: Häagen-Dazs, Old El Paso and Nature Valley original granola bars. Following this year’s Cannes International Festival of Creativity, Y&R South Africa has achieved its best-ever ranking in the Creative Circle Ranking for Group Agencies in South Africa. In South Africa’s townships, pedestrians are often knocked over or killed at night while walking home from bars and taverns in poorly lit areas. The Land Rover Defender story is a rich tapestry of adventures that have come to pass on the African continent over the last 67 years, starting with the Series I in 1948. To communicate the Night Tours offering, Joburg Zoo and Y&R South Africa set out to explore a highly impactful and interactive way to maximise awareness and to encourage visitors to book a night tour. Instead of opting for traditional and more commonly used scare tactics, Y&R South Africa demonstrated a relatable and positive reason to encourage people to buckle up their seat belts: to stay alive and be present for the special moments in life. Labstore South Africa, shopper marketing business unit of Y&R South Africa, recently added Amka Products’ Gold Series to its client stable on a project basis, commencing 1 June 2015. As a communication officer, I deal with an influx of proposals on a daily basis, and although all are noble and touching, corporate South Africa needs to be cut-throat about who they are supporting, the reasons why, and the hierarchy of needs against the backdrop of the current societal landscape. Y&R Advertising’s newest senior recruit, Charles Pantland joined the Johannesburg agency as creative director this month to creatively head up the Investec and Land Rover accounts. 10 of the best things about my One Show experience — Graham Lang, CCO of Y&R South Africa and Africa. Y&R South Africa and sister agency, NATIVE VML, recently acquired the business for University of Cape Town (UCT) Graduate School of Business (GSB), with the three-year contract encompassing ATL, Brand, Communication and Media Strategy, BTL and Digital services. Y&R South Africa’s Durban office was recently awarded the entire media portfolio for existing ATL client, Joekels Tea Packers, and serves as another business showpiece for the agency’s blossoming strategic media offering. Graham Lang, Y&R South Africa’s chief creative officer, has been invited to join the jury at two of the industry’s top international awards shows: The One Show and The New York Festivals. Based on a peer recommendation programme and his world-class talent, Werner Marais, Y&R Cape Town’s Creative Director, has been invited to sit on The New York Festivals 2015 International Grand Jury. In a proactive effort to support the sponsorship of the Sunfoil Test Cricket Series between South Africa and the West Indies, Y&R Durban and the agency’s shopper marketing unit, Labstore SA launched a hugely successful Sunfoil Facebook campaign. Y&R South Africa's Durban office was recently awarded the account for International Hotel School, Africa’s leading hotel school. The agency will be providing an integrated offering, including ATL, PR and Media. Late last year, Y&R South Africa made two senior appointments including Sampa Diseko, as strategy director, and Christo Nel as associate executive creative director on the Pick n Pay account. In association with TRUTH coffee, Y&R South Africa recently launched the 'Take the Plunge’ initiative to promote awareness about exploitation in the coffee industry, and will be empowering local coffee shop owners, roasters and suppliers to communicate their commitment to ethically sourced coffee to their consumers. Spirits are high after this past weekend’s Loerie Awards as Y&R South Africa celebrates one of their best years yet. The agency was awarded in the traditional and design categories, earning itself two Gold, one Silver and four Bronze Loeries, plus two Craft Certificates. Cosmopolitan South Africa recently revealed the results of their #CosmoMillennials survey during events in Cape Town and Johannesburg. Partnering with Joan Snyder Kuhl, a New York-based Millennial expert and consultant, the survey of 3 400 respondents elicited over 34 000 open-ended responses with the aim to better understand the South African Millennial. Y&R South Africa is beaming after it was recently announced that the agency won the Sunfoil Cricket Activation side of The Willowton Group Business after a combined pitch effort between the Durban and Johannesburg offices. Y&R South Africa’s Johannesburg office is celebrating a well-deserved trio of pitch wins after it was announced that the agency has been awarded the Two Oceans, Nederburg and Drostdy-Hof accounts under the Distell motherbrand. Tracy Roberts recently joined Y&R South Africa’s Team Pick n Pay, taking on the leadership role of Managing Partner as a crowning addition in maximising an already talented staff complement, following a bout of strategic promotions in 2014. Y&R South Africa recently created the Land Rover 'Bottle Cap', a novel solution to keep Land Rover drivers hydrated in the onslaught of the harsh African climate. Y&R South Africa is celebrating their first ever Cannes Lion Radio win for the Colgate Plax ‘Surprise Party/Teacher Greeting/Wedding’ radio campaign. Y&R South Africa is one of the first local advertising agencies to be awarded Cannes Lions at the first-ever Health Lions ceremony. By Andrew Welch. As we awaited the outcome of SA’s fifth national election, I was struck by a number of parallels between the world of politics and the world of brands and branding. In the brand world, we are adept at being courted by competing products, services or companies, all vying for our attention and custom. We are much less adept at being courted by political parties. Y&R SA’s Johannesburg and Cape Town office recently announced strategic appointments and role enhancements within Team Pick n Pay to deliver ongoing, top-notch service to this leading retailer. Y&R Cape Town's Hope Soap campaign brought home the Grand Prize in the Avant–Garde category at the New York Festivals, representing the highest award within that category which recognises and rewards a non-traditional approach to a brief. After a successful awards season, Y&R South Africa is sitting proud in fourth place - up from eighth - on the Creative Circle Ranking for Individual Agencies for 2013. Two Danone TV commercials produced by Y&R South Africa have featured within the top 10 list of Millward Brown’s ‘Best Liked Ads from the fourth quarter of 2013’. Y&R South Africa's Durban agency has just been awarded a 12-month contract with Transnet Port Terminals. It's the agency's first state-owned enterprise account since it started operating in 2008. Global Chief Creative Officer Tony Granger and Chairman of Y&R Africa and South Africa Yossi Schwartz announced today that Graham Lang was adding the role of Chief Creative Officer of Africa to his responsibilities as CCO of Y&R South Africa. Y&R South Africa recently appointed the well-respected and seasoned Media Strategist Cristina Viegas, who will be spearheading the media offering in 2014. As the awards entry season kicks off, Y&R South Africa’s Johannesburg office is proud to announce the appointment of two senior Creatives to international award juries in 2014. Y&R Cape Town has been awarded the above-the-line and below-the-line marketing design for the Western Cape Government in two separate pitches. The Association for Communication and Advertising of SA (ACA) recently appointed its 2013/2014 Board of Directors. Y&R Johannesburg is pleased to announce that its managing director, Kingsley Potter was elected to serve on this board, and has expressing interest in being involved specifically in the Government and Regulatory portfolio. Spirits are high after this past weekend’s Loerie Awards as Y&R South Africa celebrates its most successful year yet. The agency was awarded in the traditional, design and digital categories, earning itself two Gold, four Silver and three Bronze Loeries, plus two Craft Certificates. Y&R Johannesburg recently appointed Jacques Shalom as Group Creative Director on the Telkom account, as well as Jaguar, Danone and Adcock Ingram. Pietermaritzburg and the Midlands’ quintessential newspaper, The Witness is introducing a new daily edition in the Durban market this year, and appointed Y&R Durban to conceptualise and implement the launch campaign. Two of South Africa’s biggest clients, Pick n Pay and Telkom who sit in Y&R South Africa’s stable, received several accolades at the 15th Sunday Times Top Brands 2013 Awards hosted on the 15th August 2013. Y&R hosted the Creative Circle Exco meeting and Ad of The Month judging for the first time in its history at their Johannesburg agency on Thursday, 25 July 2013. Y&R Johannesburg has just finished the production of a commercial for a self-storage company, XtraSpace. A young woman, relaxing in her home late at night, is disturbed by a loud sound outside her house. Someone is trying to break into her home. She flees, trying to find a hiding space, but her house is too packed with clutter, and eventually she just gives up and hides behind the curtain. May 23, 2013: Ninety years after John Orr Young and Raymond Rubicam opened up Y&R with a single client, the agency is celebrating its 90th year in business as one of the world’s largest, iconic and most dynamic advertising agencies. Shopper marketing is the fastest growing marketing discipline globally, attracting more of a share of marketer's budgets than ever before . Inline with this growing trend, Y&R South Africa appointed Michelle van Trotsenburg as the Business Unit Director: Shopper Conversion Marketing late last year to lead the Shopper Marketing offering within the agency. The Apex Awards, synonymous with strategic and creative effectiveness, has invited a Y&R representative to join the judging panel for the second consecutive year. Bibi Lötter, Y&R Johannesburg Creative Director has accepted the invitation to sit on the 2013 jury, delighted to be considered amongst the industry mix. The latest TV commercial produced by Y&R South Africa for Sunshine D aims to own the moments and rituals where delicious, tasty South African food and Sunshine D meet. The ad was shot by Petar Spiljevic at Velocity films. Creative Circle briefed Y&R Cape Town to come up with a creative concept for a 'save the date' and invitation to the Creative Circle Ad of the Year awards, taking place on Tuesday, 26 March at The Venue in Johannesburg. Agency Art Director, Brinke van Zyl and Copywriter, Aadil Dhalech were given the open brief challenge. SKYY® Vodka proudly announces the launch of its first-ever TV advertising campaign in South Africa. Renowned as the drink of choice for the world’s most stylish party people, the advert offers a taste of the glamorous lifestyle associated with the iconic spirit in the world-famous cobalt blue bottle. Issued by Y&R “Authenticity is the benchmark against which all brands are now judged.” John Grant - The New Marketing Manifesto With an abundance of brands to choose from, and a wealth of information available from both the companies that manufacture them and the people who buy them, honesty and authenticity are emerging as the values that matter most, in a new era of branding. Y&R Johannesburg has appointed Kingsley Potter as its Managing Director effective 14 January 2013. The appointment follows the departure of Melanie Behan, who left the agency late last year to pursue a new career path outside of advertising. For at least half a decade, the demise of the traditional TV industry has been predicted. Much like newspapers before them, the changing face of technology and on-demand content is stealing eyes away from their traditional channels and the advertising that funds them. The print industry ignored this for a decade – one of booming success - but these were death throes, and they eventually collapsed. At the moment, TV is facing all the same warning signs; the same audience moving to consuming their entertainment through different media - online, on-demand and recorded on PVRs. And just like print before it, TV is going to have to eventually deal with their share of media spend shrinking dramatically. To demonstrate an under counter washing machine’s unique capabilities and capacity LG and Y&R decided to take advantage of the 2011 Rugby World Cup. LG’s 11kg steel washer was built in front of the player’s tunnels during the international sports event of Super Rugby.Players would run out onto the field clean, play the heavy dirt duty sport, go back into the washing machine tunnel during half time, talk strategy, change into clean kits, and when the second half resumed they came back out of the washing machine tunnel clean. Virgin Atlantic Airways "Luggage Tags"
How do you let people know that Virgin Atlantic is the most affordable way to travel to London when you have little budget to reach them? Y&R South Africa is a community of creative minds who come to work to constantly challenge and reinvent; to find better and more effective ways of making our clients’ brands move their customers. And to do so in a manner that is differentiated for their brand while being relevant to their specific customer. In a phrase, we come to work to help our clients’ brands Resist the Usual. To be clear, this is not difference for difference sake; that way lies gimmickry and short-termism. This is difference and relevance, the cornerstone of all successful brand building. Our community use the power of insights, ideas and impact to deliver work that is impossible to ignore.This is what binds us together. This is what fires us up in the morning. This is who we are.